Black canvas Bible cover with zip closure and handy spine handle will keep your Bible safe and make it easy to take to church and study. Names of Jesus design makes a great conversation starter. 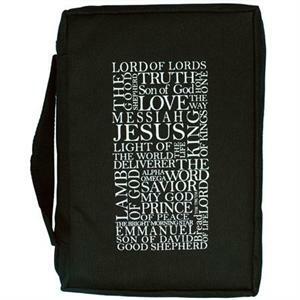 Durable canvas cover; fits Bibles up to 9" x 6" x 1.25"; internal pencil pocket.